Tipu Jayanti 2018 protests: The BJP had appealed to the government to drop the celebrations after the JDS-Congress coalition government had announced that Tipu Jayanti would be observed on November 10. 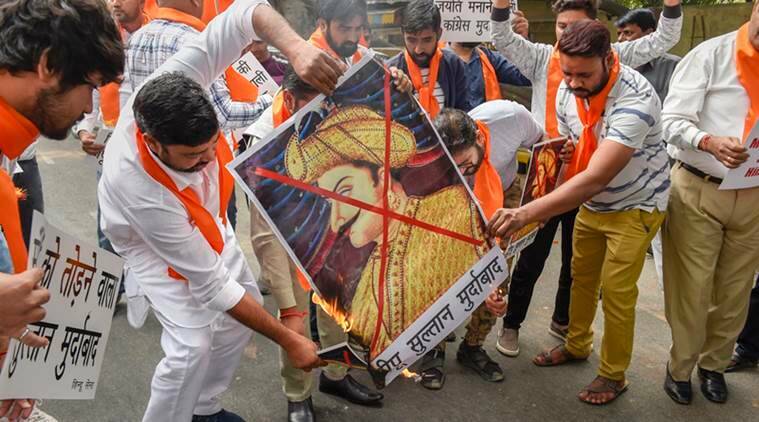 Tipu Jayanti 2018 protests: Hindu Sena activists stage a protest over the celebration of ‘Tipu Jayanti’, at Jantar Mantar in New Delhi. Demonstrations and protests broke out in Madikeri in Karnataka early on Saturday even before the government-sponsored celebrations for the birth anniversary of the controversial 18th-century ruler of erstwhile Mysore kingdom Tipu Sultan began. Security has been tightened in the area in the wake of a shutdown called by various groups, including the BJP and Codava National Council. Several people have also been detained. Meanwhile, both the Chief Minister and his deputy skipped the event, while Kumaraswamy cited medical reasons, Parameshwara who was to replace him too skipped it, as he was town officials were quoted as saying by PTI. The BJP had appealed to the government to drop the celebrations after the JDS-Congress coalition government announced that Tipu Jayanti would be observed on November 10 in continuation of the previous Congress government’s policy. While Tipu Sultan is considered a freedom fighter by the state government, he is considered a “religious bigot” by the BJP and its affiliates. The Tipu Jayanti celebrations, which began in 2014 under the Congress government, have been marked by protests and court cases every year. I have information that Karnataka CM HD Kumaraswamy couldn't attend the Tipu Jayanti celebrations due to health issues. Deputy CM G Parameshwara also couldn't attend. Somewhere it seems like it's an insult to the community. There's no doubt about it: Congress MLA Tanveer Sait. 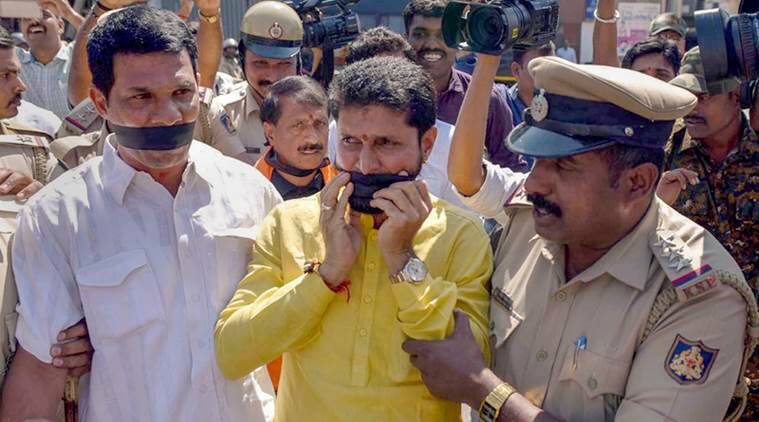 BJP MLA and former assembly speaker K G Bopaiah was detained in Virajpet during the protest, police said. In Mangaluru, some protesters tried to barge into the zilla panchayat office with black flags where the event was being organised. The protestors were later detained by police. In Yellapura of Uttara Kannada district too, there were reports of detaining protesters. Similar protests were reported from Chikkamagaluru, Ballari, Karwar and various parts of the state. Police have clamped prohibitory orders in most of the districts in the state as a precautionary measure. Deputy Chief Minister G Parameshwara, who was to inaugurate the main event at Vidhana Soudha, the seat of state legislature here, in the absence of Kumaraswamy, also skipped the function. Parameshwara did not attend the event as he was out of town, sources at his office told PTI, without divulging any details. India has always been fascinated by the image of the eighteenth century Mysore ruler. There are those who indulge in what is often referred to as ‘Tipu mania,’ and hold up the image of the Sultan as a nationalist hero who modernised the economy and society of Mysore. There are also those for whom Tipu’s name is associated with a past engulfed in tyranny and persecution. What is interesting is how his image has served the purpose of contemporary politics, to divide vote bank down the middle. Read full story here. 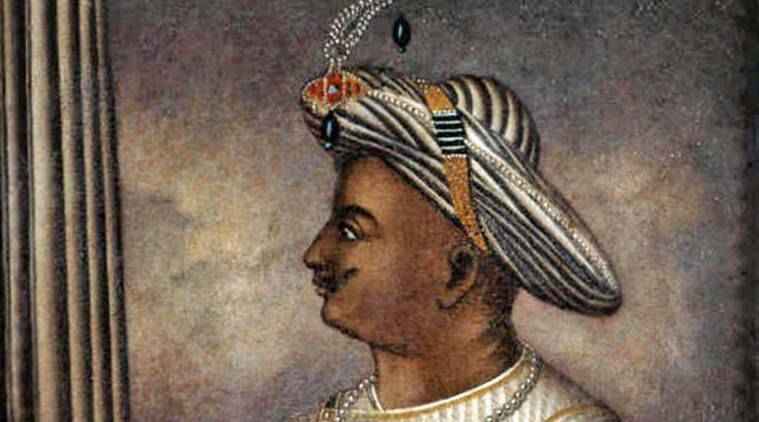 There is much ambiguity about Tipu’s image, which varies from that of a nationalist to one of a Muslim persecutor of Hindus. Indianexpress.com travelled to Kodagu to understand how this important region in Karnataka feels about the issue. Read full story here. Tipu Jayanti celebration at the Vidhana Soudha will be held in the presence of Deputy Chief Minister G Parameshwara, as Chief Minister H D Kumaraswamy will not be present due to health reasons. Wishing success for the Tipu Jayanti celebrations, Kumaraswamy had in a statement said, "Tipu's progressive measures in administration, his quest for innovation are commendable." Elaborate security arrangements have been made in districts like Kodagu and Chitradurga, coastal regions among others, where local communities are opposed to the celebrations. Superintendent of Police of Kodagu Sumana D Pannekara told PTI that the situation was peaceful so far and security arrangements have been made to ensure that no untoward incidents took place. She said no one would be allowed to forcefully shut shops and business establishments. "Around 500 police personnel along with officials have been deployed in and around Vidhana Soudha (Bengaluru).. DCPs of different zones in the city will be in charge of security in their respective jurisdiction. About 15,000 police personnel will be manning the city," Bengaluru Police Commissioner T Suneel Kumar said. BJP MP Rajeev Chandrasekhar tweeted, "There was a time (long ago) when Siddaramaiah was respected as a leader and an administrator - now he's reduced to this- a sad pathetic leader trying desperately to corner some vote bank or the other after having barely scraped through his elections." It’s been two centuries since the Sultan used the coast to take on the British fleets, but in the process, he was brutal towards the local Christians. A watch tower constructed in 1784 bears testimony to Tipu Sultan’s desire to keep out English warships from entering Mangalore, the chief port city of Karnataka. The Sultan Battery, as the Mangaloreans call it, carries a darker side to its past as well. It is believed that 25 churches were demolished, and their bricks used to put together the structure. As the churches fell, Tipu’s hand came down strongly upon a significant population of Roman Catholics that had made Western Karnataka their home. Read full story here. Last week, the state government had accused the BJP of trying to disturb communal harmony over the issue of ‘Tipu Jayanti’ celebrations. “BJP has been trying to disturb communal harmony on the Tipu Jayanti issue. We will not allow them to do it. Any attempt to disrupt law and order will be dealt with an iron hand,” Deputy Chief minister G Parameshwara had said. The event would take place without any disturbance, irrespective of protests, he had added. On Thursday, BJP state chief B S Yeddyurappa had asked authorities to stop all events planned for today. Yeddyurappa alleged the government’s intention behind celebrating Tipu Jayanti was to appease the Muslim community. “We are opposing Tipu Jayanti celebration. Nobody will appreciate this celebration. In the interest of the state, the government must stop it. Government’s intention behind Tipu Jayanti celebration is just to satisfy Muslim community,” the senior BJP leader had said in a tweet. Tipu Sultan was a ruler of Mysore and was killed in May 1799 while defending his fort at Srirangapatna against the British forces. While he is considered a freedom fighter by the state government, he is considered a “religious bigot” by the BJP and right-wing Hindu outfits. The Tipu Jayanti celebrations, which began in 2014, have been marked by protests every year. The BJP has claimed that Kumaraswamy was staying away from the Tipu Jayanti celebrations due to differences over the issue with coalition partner Congress. Several BJP legislators have asked the government not to extend them invitations to attend Tipu Jayanti programmes in the state. BJP MP from Mangalore region Nalin Kumar Kateel on Friday claimed that Chief Minister Kumaraswamy was allowing the coalition government to celebrate Tipu Jayanti to appease Siddaramaiah. Continuing its attack on the CM, the BJP tweeted, "While the Congress-JDS government is celebrating a tyrant Tippu, the CM himself goes into hiding, what is the point of celebrating a fanatic when CM himself abandons a government function. Glorifying a mass murderer just for vote bank clearly shows the mindset of this government." The Chief Minister’s Office in a statement had said that Kumaraswamy would not take part in any official function for the next three days in view of “doctors’ advice.” “On the advice of doctors, the chief minister will take three days rest till November 11. He will spend time with family on these days and there will be no official engagements on these days,” the communique had said. While Cong-JDS govt is celebrating a tyrant Tippu, the CM himself goes into hiding, what is the point of celebrating a fanatic when CM himself abandons a govt function. Glorifying a mass murderer just for vote bank clearly shows mindset of this govt. To protest against the celebrations, BJP workers raised slogans in the premises of the deputy commissioner's office this morning. Karnataka Minority Welfare Minister BZ Zameer Ahmed Khan met former CM Siddaramaiah at his residence in Bengaluru today. “Tipu was a tyrant and a religious fanatic. Those who tried to exalt him suffered huge losses,” BJP MP Pratap Simha had earlier claimed. The BJP also took a dig at CM Kumaraswamy’s absence in the event. Party spokesperson S Prakash quipped that the chief minister was avoiding taking part in Tipu Jayanti. The celebration of Tipu Jayanti is particularly opposed by people from the Kodagu region of Karnataka citing incidents of violence that occurred in Kodagu in 2015 during celebrations and the historical animosity among the people of the region towards the 18th-century ruler. In 2015, Hindu outfits opposed to the celebrations clashed with Muslim groups who took out a rally to Madikeri town in Kodagu district. The clashes resulted in two deaths. Drawing out the similarities between Tipu Sultan and the Congress, Karnataka BJP posted on Twitter, "Both were anti Hindu Both believed in suppressing Hindus Both were responsible for Killing of Hindus Both believed in minority appeasement Both wanted to divide Hindus No wonder Congress is worshipping tyrant Tippu." No wonder Congress is worshipping tyrant Tippu. PTI, earlier quoting an official, reported that the event in Bengaluru will be held at the Vidhana Soudha, the seat of the state legislature, as the original venue, in view of representations to the government from Muslim community leaders. As part of security measures, section 144 has been imposed at several places including Kodagu, Hubli and Dharwad cities from 6 am on November 10 to 7 am on November 11, ANI had reported. Assuring strict police action against troublemakers, Kodagu Deputy Commissioner P I Srividya told news agency ANI, "We have taken all precautionary measures. If somebody violates law and order, police will take strict action." Alleging that the JD(S)-Congress coalition government is wasting public money in the name of Tipu Jayanti celebrations, BJP District Secretary Sajjal Krishnan told ANI, "Tipu is not a warrior, he had killed so many Hindus and also attacked temples. Why are they glorifying a man like him? This is only voted bank politics. Everyone in Kodagu is opposing the celebrations." Demonstrations and protests broke out in Madikeri in Karnataka this morning even before the government-sponsored celebrations for the birth anniversary of the controversial 18th-century ruler of erstwhile Mysore kingdom Tipu Sultan began. Security has been tightened in the area in the wake of a shutdown called by various groups, including the BJP and Codava National Council. Follow our live blog for all latest updates. In 2015, Hindu outfits opposed to the celebrations clashed with Muslim groups who took out a rally to Madikeri town in Kodagu district. The clashes resulted in two deaths. The celebration of Tipu Jayanti is particularly opposed by people from the Kodagu region of Karnataka citing incidents of violence that occurred in Kodagu in 2015 during celebrations and the historical animosity among the people of the region towards the 18th-century ruler.